MobiCards eCards have everything you love about traditional paper cards with the convenience that you expect from an eCard in the digital world. Choose one from hundreds of free eCard designs and personalize your special greeting with text, clip Arts, Border and backgrounds. Learn about thank you note etiquette and expressing your gratitude with a free MobiCards eCard. Choose the most creative eCard to announce a pregnancy or new baby, or to congratulate the proud parents. Send eCards to your loved ones on every occasion to make them happy. You're engaged! Now what? With so many decisions to make, choose a free, digital engagement announcement cards and decorate with your better half. 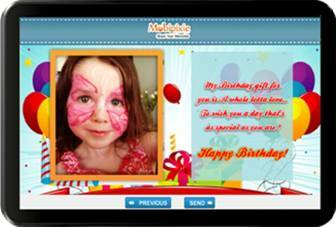 Celebrate milestone birthdays, such as 16, 21, 30, 40 or 50, with free birthday eCards by MobiCards. There are probably a million reasons to send thank you e Cards. Don't find them just send them eCards now to make it loved ones special. You can choose from 100 birthday eCard designs, which one is right for you? Find out here! Don't spend a lot of money and time on purchasing and posting paper cards, Using MobiCards you can now send free e-cards only in few seconds. Send free eCards to wish friends and family a very happy birthday. Check out MobiCards featured designs!